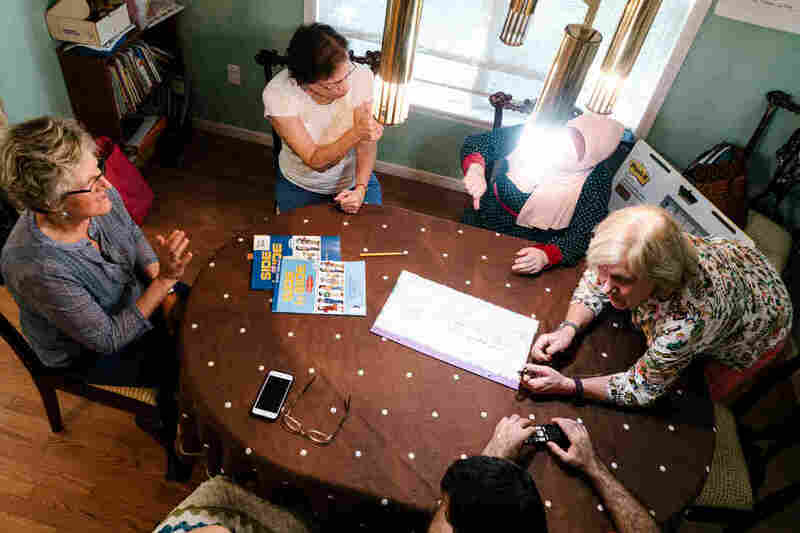 The Hopes (Security) And Fears (Bears) Of Syrian Refugees In New Jersey : Parallels Osama and Ghada and their four kids fled their homeland three years ago and recently reached the U.S. as part of the 11,000 Syrian refugees arriving this year. Every day brings new challenges. Ghada and Osama sit on their deck in their new home in Princeton, N.J. Their family has been resettled from Syria and is being sponsored by the Nassau Presbyterian Church. Due to security concerns we are only including first names. On a bright spring afternoon this May, Tom Charles drove to Newark International Airport to pick up a family of Syrian refugees. Charles is an attorney and a bank consultant, devoted to data and details, but he had scant information on the family that would become part of his life for the next year. He was also sure the Syrian family knew nothing about his team from Nassau Presbyterian Church, who would drive them from the airport to a donated house in Princeton, N.J.
"They know nothing about us. Nothing at all," said Charles, "They are arriving at the airport and they've only been told that someone will greet you." When the Syrian family landed they were surprised to see a smiling group of strangers at the airport arrival hall with gifts for the four young children. The 10 suitcases that arrived along with the refugees surprised the church team. "We had assumed they would have no luggage, or not much luggage, and I thought, what is all this stuff?" said Sue Jennings, a veteran of the Nassau Church's resettlement team. Tom Charles and Sue Jennings are two of the lead volunteers helping Osama, Ghada and their family settle into their new home. "The suitcases were filled with food," she said. "So, that says something about the anxiety and uncertainty of coming here." 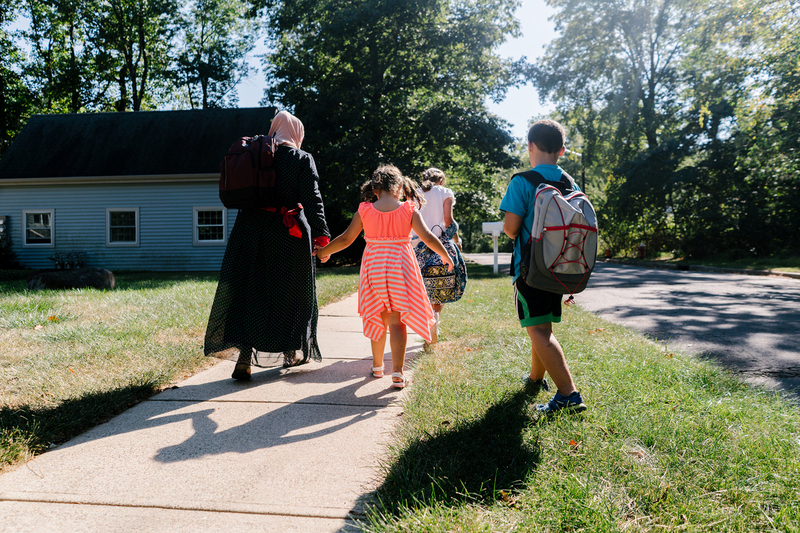 Across the country, private organizations, faith-based groups and individuals quietly have been working to ease the plight of Syrian refugees. More than 11,000 have arrived in the U.S. this year, fulfilling a pledge by the Obama administration. That figure far exceeds the number of Syrian refugees accepted during the previous four years of the Syrian war, and the White House is calling for a big bump in the overall number of refugees next year. But the "surge" this year has overwhelmed official resettlement agencies, with the majority of Syrians landing in the past five months. 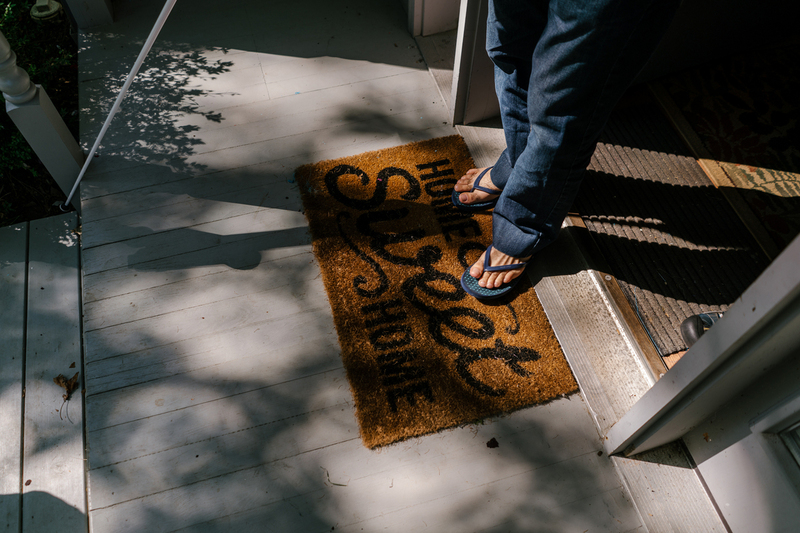 These private groups are volunteers stepping in to offer services and resettlement support. A week after the awkward first meeting at the airport, the Syrian Muslim refugee family sat in the front pew of Nassau Presbyterian Church and marveled at the jubilant applause. 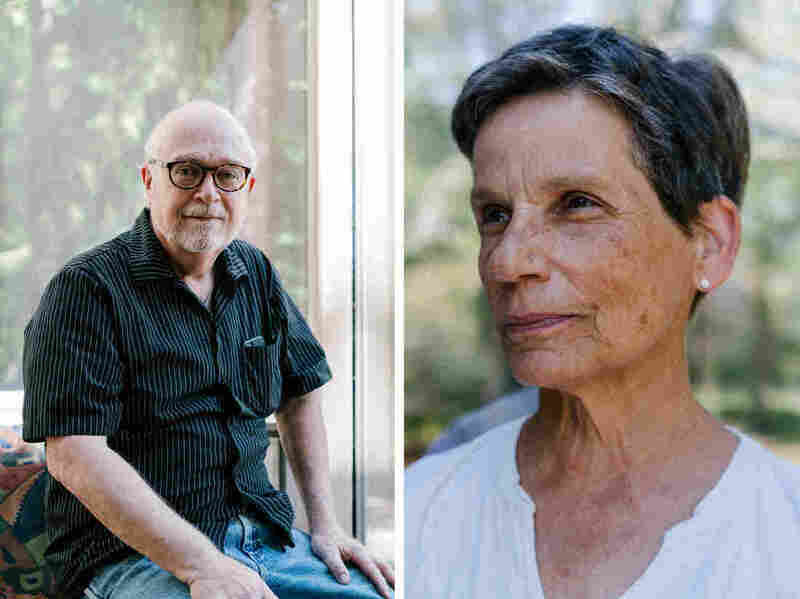 The family is concerned about the safety of relatives still in Syria and asked NPR to use only their first names, Osama and Ghada. "The father, Osama, a calm and resilient man, is blind, injured by a mortar attack while visiting his uncle's home in 2012," Charles said from the pulpit as he introduced the family. "The mother, Ghada, is a gracious hostess, preparing coffee for all visitors," he continued as Ghada quietly wept at words she barely understood. Nassau Presbyterian Church in Princeton, N.J., whose community helped resettle Osama, Ghada and their family. It had been a long journey for the family, who are among the nearly 5 million Syrians who have fled their homeland since the war began in 2011. They survived the war in Syria and had struggled for three years as refugees in Jordan when they were notified by the U.N. refugee agency, UNHCR, that they had been accepted for resettlement in the U.S.
Nassau Presbyterian Church has a long history of supporting refugees, including Cubans, Vietnamese, Bosnians and Iraqis, said senior pastor David Davis. "We've been in the refugee business for 50 years — it's been a family every five years," he said. "For us, it is acting and living out our faith." The church sponsorship provides financial and practical support, including housing, school enrollment, language training and help in finding employment. In practice, it's more like an adoption — an intense relationship to integrate the outsiders. Ghada offers a tray of cookies she made to her husband Osama and Sue Jennings and Tom Charles, the two volunteers from the Nassau Presbyterian Church. But in the current political climate, when a majority of Americans oppose Syrian resettlement, it's a high-pressure good deed. "It feels different to know that there are those in the community who think we are doing the wrong thing," said Davis. In a way it's a challenge to the majority of state governors, including New Jersey's Chris Christie, who want to block all Syrian refugees because they say some could be dangerous. "To think that one Muslim family could be a threat is just irrational to me, given that the vetting process, the security clearances, are significant," he said. "I do think that if we had somehow been asked to support a Syrian Christian family, of which there are so few, the response would have been qualitatively different." "What is the word for 'bear?' " asked Ghada in an intense English language class in the dining room of the donated family home. Beverly Leach (right) leads an ESL course for Ghada and her husband Osama, two newly resettled refugees from Syria, in their home. They are accompanied by other volunteers. Startled, Beverly Leach, an experienced English teacher who leads the church-sponsored language team asked, "did you see a bear?" The question was more than idle curiosity. It's a sign that for newly arrived refugees, America can be an alien place that doesn't look like the glimpses they've seen on social media or in the movies. 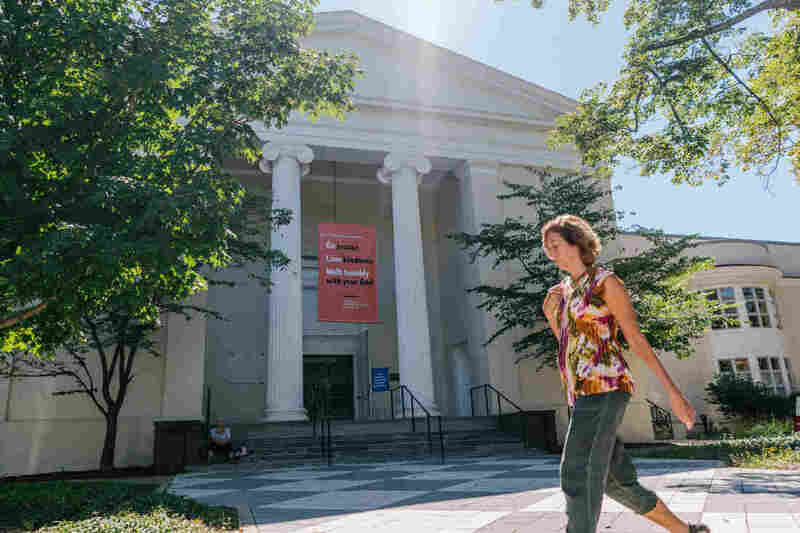 There are surprising fears, says Louisa Ajami, another member of the Nassau church team. Ajami is an Arabic speaker, and when she first was introduced to the family, Ghada asked if there were "dangerous creatures" in the woods. "And I said, 'no, probably not,' and she still looked nervous, and I said, 'but there are bears' — and I probably shouldn't have said that," Ajami said. Bears are not uncommon in this part of New Jersey, and the family heard about one that had been spotted nearby. The news was terrifying, especially for the kids. After years of war and chaos, they are still hyper-vigilant when it comes to threats, said Ajami. "They are lost, they have no frame of reference. None whatsoever," she said. "They are learning it all anew on top of everything else they have to deal with." (Top) Osama's cane stands next to the door, ready for a walk. 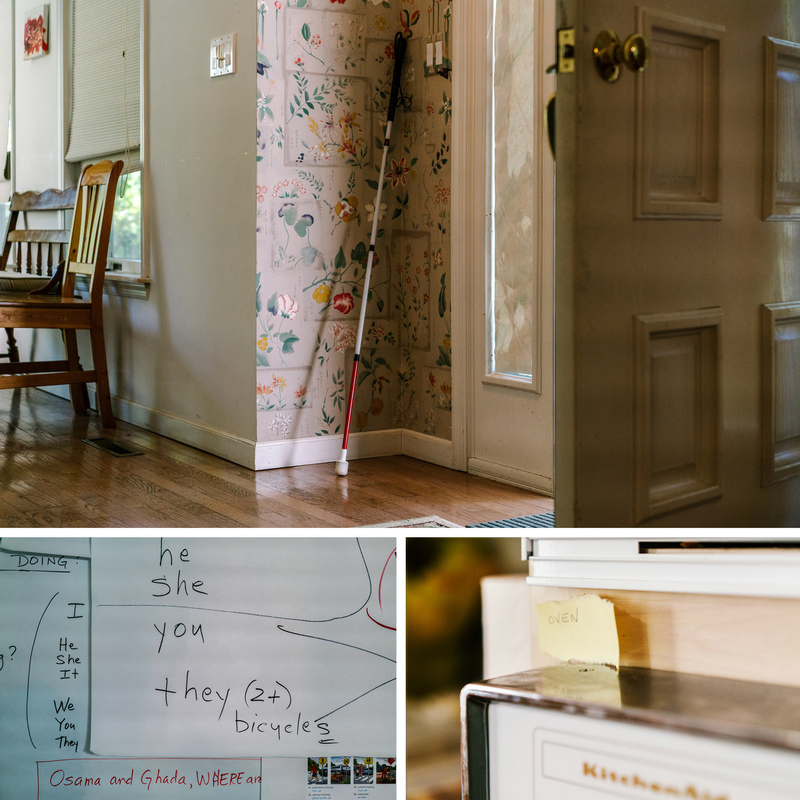 (Left) Some of the English-language signs that adorn the walls of the room in their house, where ESL classes take place each day. (Right) One of many small post-its stuck to appliances throughout the house, labeling things with their English names to help the family learn. Osama knows there's a political debate in this country over resettling Syrian refugees but he is not sure what it means. Supportive church members surround him. The local Muslim community has embraced his family. 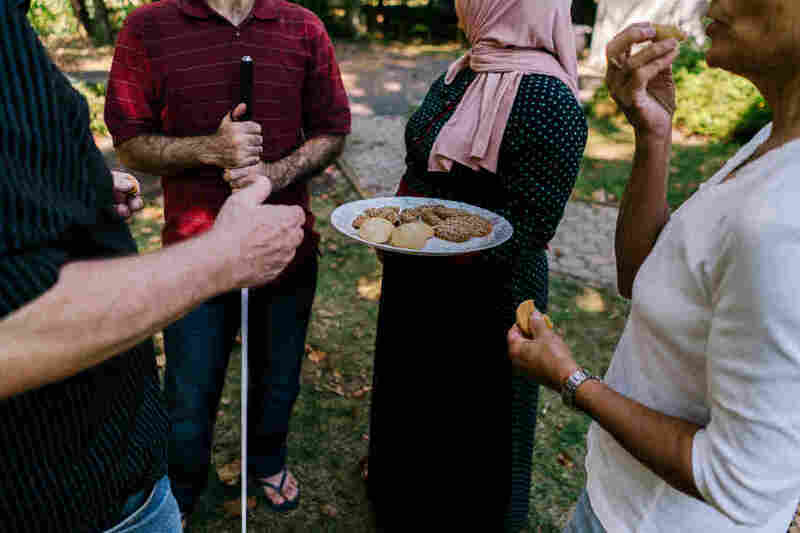 They openly observed their first Ramadan in America, fasting from daylight to sundown, and joined more than a thousand America Muslims who ended the month of fasting with prayers and family picnics in a public park. "I didn't expect minorities to have that much freedom," he says, "I expected them to pray, and then everybody needs to go home." It's another lesson about America. 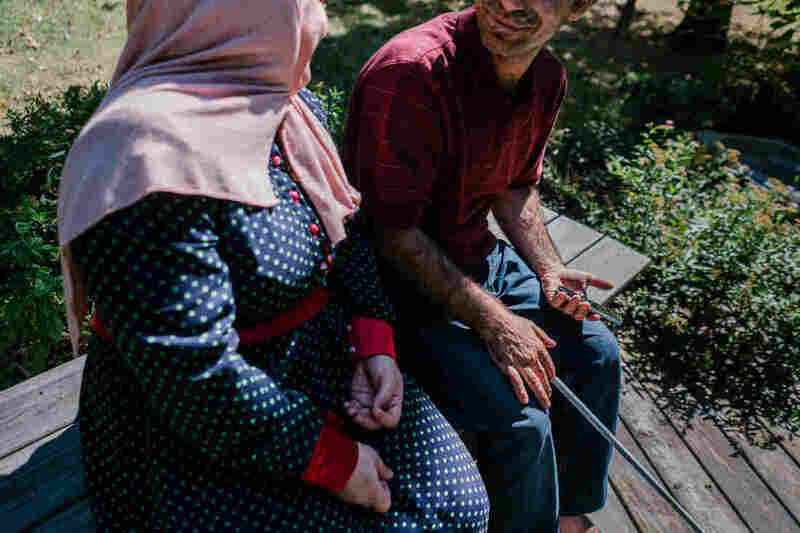 The war has left its mark on the Syrian family, especially 35-year-old Osama. He is disabled after surviving a 2012 mortar blast that blinded him, scarred his face and broke most of his teeth. Sue Jennings, part of the Nassau Church team, gets him the medical attention he needs from a dentist who treats refugees for free. "She certainly can give him a more beautiful smile," says Jennings. "She hopes to give him a full mouth of teeth." (Left) Ghada and Osama learn car vocabulary from Barbara Ajami. (Right) Osama walks outside after their ESL class. The dentist, Jasminka Kopanya, knows what it's like to be torn from everything familiar, to feel lost and overwhelmed. She was a refugee from Bosnia two decades ago. "We are not aware how much we don't know in the beginning," she says. Even now it is painful for her to recall that first harrowing year after landing in America with her husband and young children. "It was tough, that time," she says. The Nassau Church also sponsored Kopanya, and she was able to restart her professional career with church support. She wants to assure Osama that he can make it, too, but there is no common language yet. Free care is the way she sends the message. "It's a good feeling to help," she says. "I understand." In the four months since the family arrived in Princeton, Osama has been learning how to use a white cane for the first time. He navigates short solo walks outside. He has been accepted into a program for the blind that offers vocational training. The refugee family and their Nassau church sponsors have a comfortable routine. Tom Charles and Sue Jennings sit at the dinning room table, and Ghada serves Arabic sweets and strong coffee, and insists Charles use his "special cup" that is larger than the others. They were all strangers just a few months ago, meeting for the first time at an airport. The family heads home after everyone is off the bus. When the four Syrian kids burst through the door after school, they turn to Jennings to ask about a music program. "Cello, in school," said the youngest boy, and Jennings beams. "Did you hear his English!" The bigger challenges are ahead. Can these Syrians find their way in the community when the church sponsorship ends after a year? For now Jennings, a new grandmother, admits she spends more time with the Syrian family than her own. She's organizing a trip to buy shoes for the children. She knows all of their shoe sizes. Osama steps out of his home on his way with his wife to pick up his children from the bus.